Mini Memories are a series of three charts designed with the Sudberry House 3″ X 3″ Mini Wooden Boxes. The charts were introduced by category and each chart contains 4 different designs specific to that category. Mini Memories of Love offers great gift ideas for Valentine’s Day, as well as year-round. Be creative! If you like the design, but don’t want to stitch it as a mini box, then stitch it on the fabric of your choice. 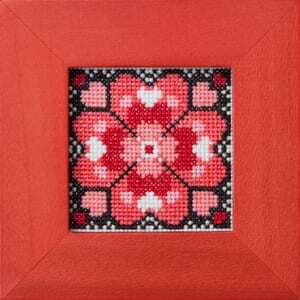 For example, if you choose to stitch the design with 2 threads of floss over 2 threads of fabric on 28ct Linen, you will end up with a design that is exactly 3″ X 3″. Stitch it as an ornament, a hand towel, or for a mini frame! 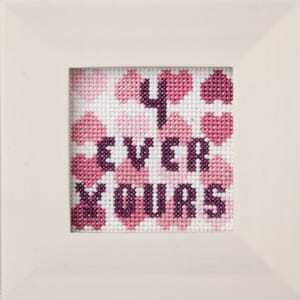 4 Ever Yours – To your special someone. Heart Flower – Plainly put, it’s just a pretty little flower box! The perfect place to store that special ring or necklace you receive from your sweetie! 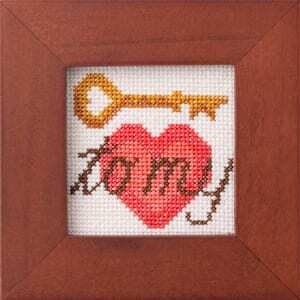 Key To My Heart – Another wonderful token of love to give to Mr. Right. 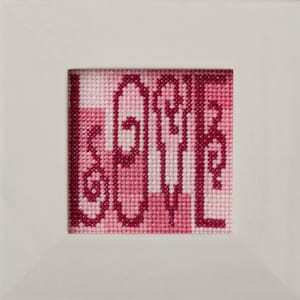 Love – Little girl, teenage, or lady friend, this little box would be love and cherished by any female in your life. Materials Summary: Models stitched with Sullivans floss. Anchor and DMC comparables provided in chart. Sudberry House Mini Wooden Boxes: Purchase for your local or online independent needlework shop or go to Sudberry House, where the mini box retails for $19.50.